Things have got a little less confusing.. So, big congratulations to Alex J - first an MVP and now a Microsoft employee to boot... (which I suspect trumps his MVP status, probably should be MVE now, for Employee!). On a side note, I'm thinking of taking over the organization/blogging etc. of the Sylvia Park Architecture Chats in the other Alex's absence... It would be a real shame to let it die once Alex J has moved to the states... at any rate, something to talk about this coming Thursday at the next chat! I decided to have a play with some of the new aggregation-esque platforms this evening... for a break from cutting code...So first off I had a play with dapper, turning the castle project's build feed (that's html) into an RSS Feed... It was painless, and required zero skill ... but it was limited in what it was capable of achieving... basically you can just just click on the content you want, give it a name, then pick which named parts will make up say an RSS feed. It's pretty elegant at what it does, though I think it's got a way to go before it'll parse some of the more tricky content out there. 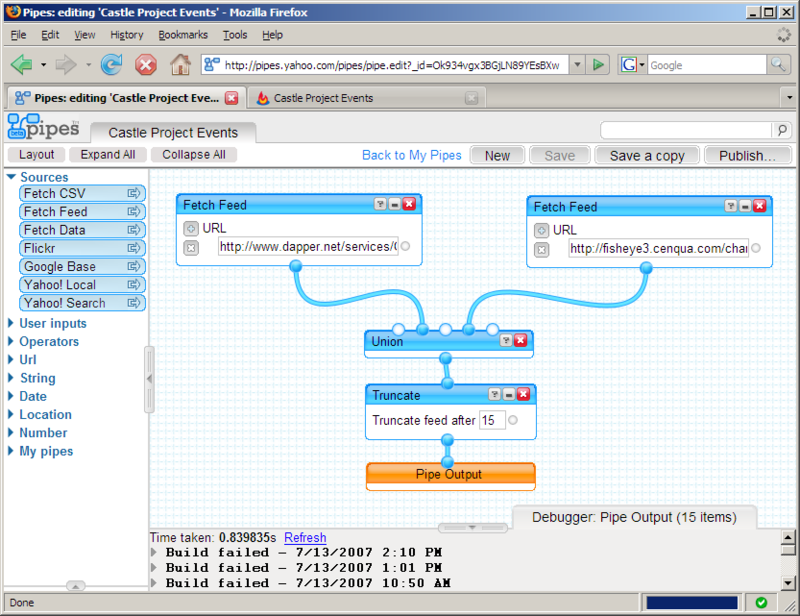 The next thing I did was to have a go with yahoo pipes... 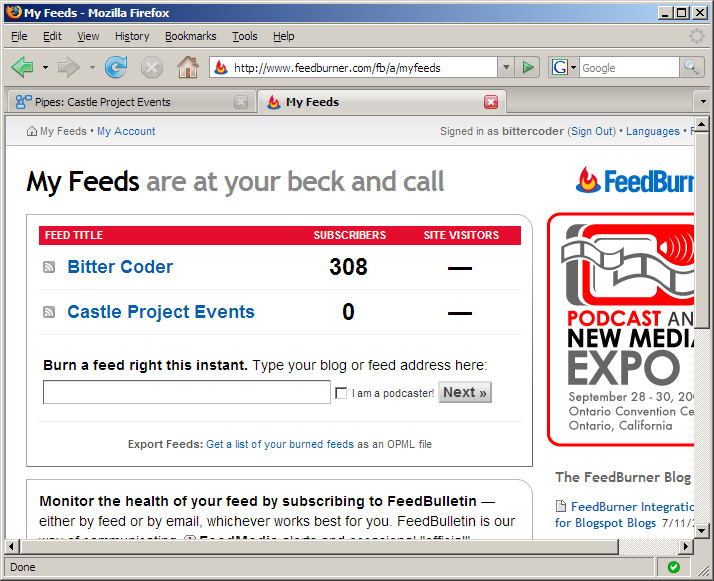 I decided to do something pretty simplistic, aggregating the feeds from the Fisheye change log RSS for the castle proejct with the feed I'd created with dapper.net for builds.... this was a delightful drag and drop experience, I didn't even read a tutorial ... I just seems to "work" exactly as you would expect. The resulting published pipe is here. I couldn't get the two aggregate feeds to sort correctly, but I'm sure it's possible using yahoo pipe's, any new events should appear in the expected order though... you can subscribe to the feed here if your curious. Of course the hosted platforms aren't much use if you need to handle private/local feeds or interact with other types of systems (like your private gmail account) and that's where I believe something like plagger comes into it's own... I haven't had a chance to play with it yet, but it's definitely on my list of things to do... there's still a lot of manual information management and categorization/organization that I'd rather hand over to some kind of automated agent. Wasted 5 minutes figuring out what was going wrong, maybe this will save someone else the effort! When using RhinoCommons and CastleProject both from trunk there's a version conflict with NHibernate. 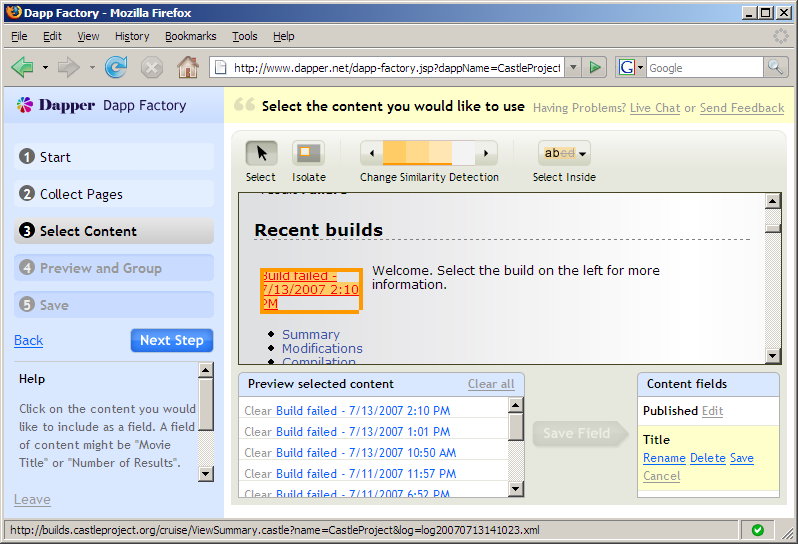 RhinoCommons has NHibernate Version 2.0.0.1001 (Including support for things like Multi criteria) ... and then the Castle Project is using NHibernate Version (1.2.0.4000) - this took me a little bit by surprise when I discovered that a monorail project I had was failing when attempting to databind properly when using the ARSmartDispatcherController... because I wasn't checking the binding errors collection, this was just failing silently... so a save would just load/save the existing record, without any binding. Well I've had a highly unproductive afternoon scrambling to rebuild my development PC after the RAID 5 decided to kill itself off... at first the pc reported one disk had fallen out of the raid... I brought it back in, rebooted, the machine started rebuilding the array then rebooted itself.. at which point it declared each disk was a member of different array... stuffed around with it for about an hour and contemplated throwing a 750gig drive in and doing a software-based recovery... but considering last time I did something like that it took a number of days to complete, I decided to just heave a large sigh, break the array up into individual disks and re-install (without RAID-5 this time...). Thankfully between svn, google apps (gmail for domains, google reader) and del.icio.us I don't think a lot has slipped through the gaps, barring the odd bit of skype history. Guess I know what I'll be doing this weekend. bleh! is nirvana just around the corner? first place, so we don't need to care.... time will tell.